David Smith (1906 – 1965) was an American Abstract Expressionist sculptor and painter, best known for creating large steel abstract geometric sculptures. David Smith: The White Sculptures is the first exhibition to critically consider the use of the color white within his work. When installed in the landscape of Storm King, the flat white planes of the large sculptures appear as dramatic cutouts. This exhibition comprises an interactive sculptural domestic rooftop, which is enlivened by music, workshops, movement, spoken word, poetry and other events throughout the exhibition. 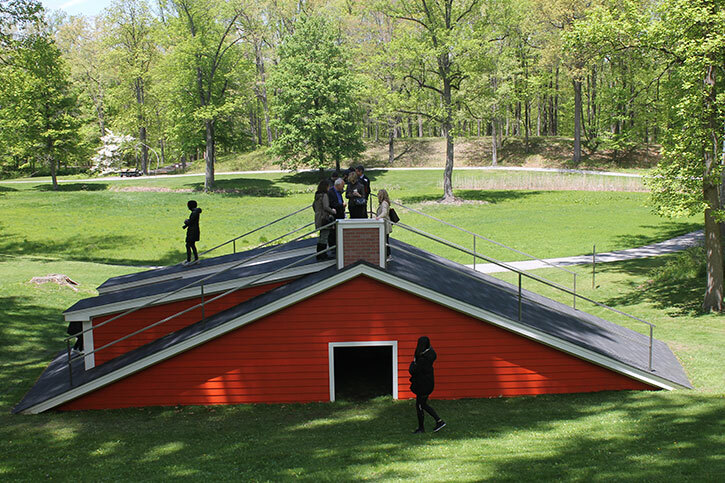 Underneath the rooftop, visitors can listen to round-table discussions that Hart recorded on topics surrounding the histories of slavery and migration in the Storm King region. Your ticket includes your admissions to Storm King, round trip transportation to Hudson NY, a guided tour by your Club Leaders, drinks and snacks. You will be sent an email prior to the event with the meet up time and location, information on the Group Members, and other important tips that you will need for this Storm King excursion. The Club Leaders for this group will be Jackie Dreier and Nicole Ziegler.